Note: For a much fuller discussion of these issues, look at How Information Technology Entrepreneurship has Changed the World, a website prepared by Dr. Jack M. Wilson of the Severino Center for Technological Entrepreneurship at the Rensselaer Lally School of Management and Technology . Moore�s Law: CPU performance doubles every 18 months. Metcalf�s Law: The value of a network scales as 2n, where n is the number of persons connected. Bandwidth Law: Bandwidth is doubling even faster. Ever since the invention of the microprocessor, the performance of a microprocessor has been doubling every eighteen months. This is directly related to the number of components that can be fit on a chip and is thus related to the minimum size of each component. Advances in basic physics and engineering have kept this law accurate for over five decades. Metcalf's Law illustrates the power of networking. The value of a network scales as 2n, where n is the number of persons connected. Consider AOL as an example. 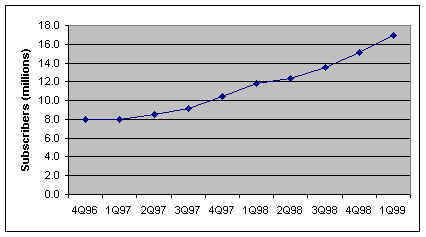 In the fourth quarter of 1996 AOL instituted flat rate pricing which meant that members had unlimited use of the service for a flat price. This led to dramatic growth in use. From that time until the second quarter of 1997, average daily use grew at an annual rate of approximately 400%. Then the growth settled down to an annualized rate of about 26%. 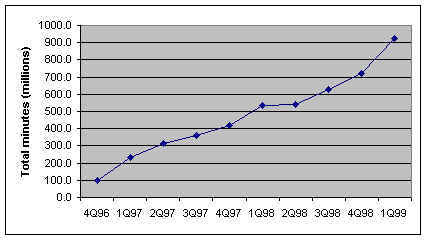 According to Metcalf's law, as the number of users doubled, the value of the network quadrupled. This is an important contributing factor to the significance of "lock in." As one enterprise attains dominance in a market, the value of their user base tends to make it difficult for another enterprise to match. This is one of the reasons that internet companies focus on market share and are valued on eyeball pairs-hours. For the last two decades, the bandwidth of communication on optical fibers is increasing exponentially just as is the power of the microprocessor. Examination of the graph below reveals two numbers of intense interest. 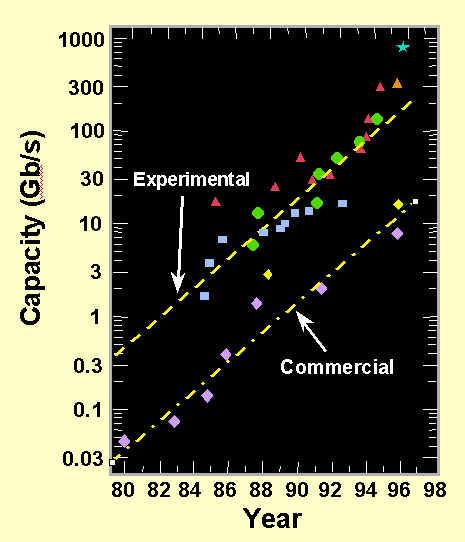 First the optical bandwidth for commercial networks has doubled over 9 times in the eighteen year period from 1979 to 1997. This indicates a doubling time of approximately two years. Notice also that the displacement between the best bandwidth in the laboratory and the best bandwidth in commercial deployment has a delay of just about 6 years. This means that commercial deployment of bandwidth will surely continue to double for the next six years leading to an overall increase in bandwidth of 8 times. Those who work in optical networking are confident that improvements in the physics and engineering will continue to improve the best laboratory bandwidth over this period. 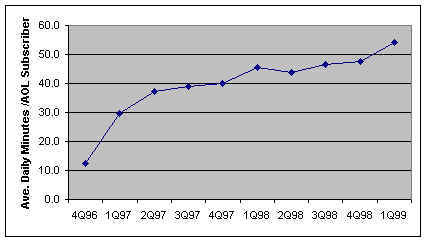 Therefore, it appears that this bandwidth doubling will continue to occur into the foreseeable future.